Window stickers are great for opening times, advertising events and in this case showing off your accreditation! 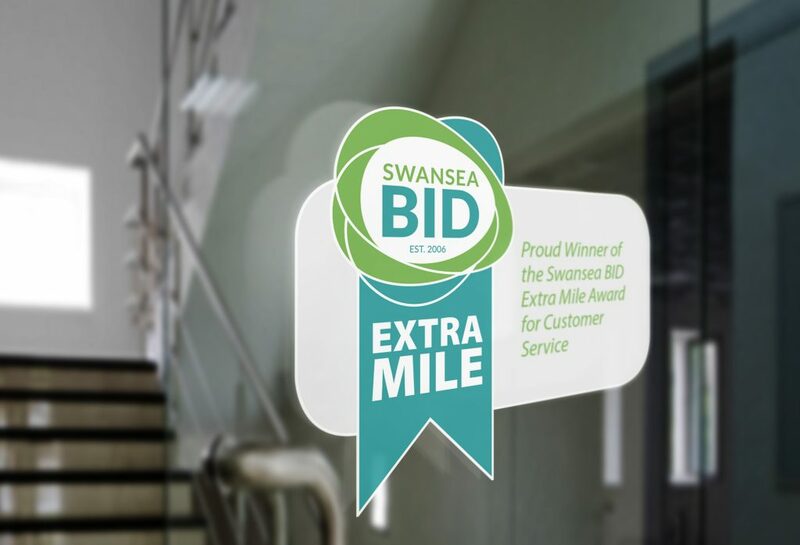 This sticker was designed for Swansea BID to award to city centre shops that go the ‘extra mile’, giving their customers service which is above and beyond. We used the original Swansea BID logo and added the tail to create a ‘rosette’ look. This works really well to show that the sticker is an award, the client also had rosettes made up to present the businesses with – this works great or a social media post too! We printed these on A6 clear vinyl so you can see the shape and the design is backed with white to give a strong image. Keep your eyes peeled in Swansea City Centre! We offer a wide range of sizes and styles, see our product page for more information – Stickers and Labels.